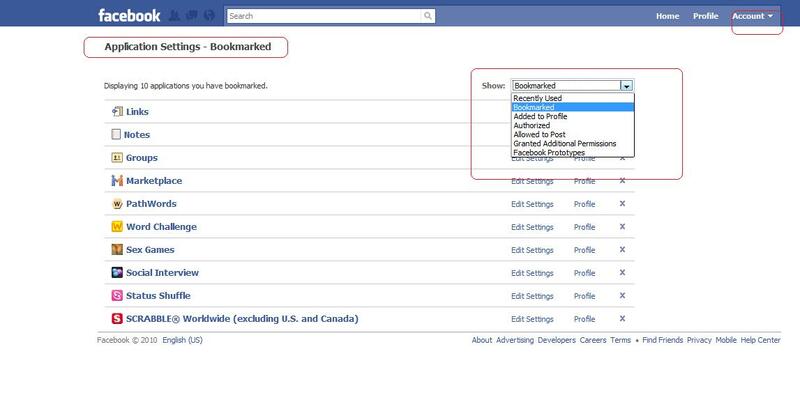 Effective Facebooking with Organized Bookmarks and Managed Applications. Although this post should have come a bit early but as the old adage goes, “Necessity is the mother of invention”. I would rather call it a discovery essentially because I needed it. Not that I did not know about it but just that I never felt the need. Fortunately, this is something that really helps me, with each day adding up to bouts of addiction to me on FB. The next few lines are about all the ways you could enhance your social networking experience via your Facebook profile. Some of these features are known to us, some are not, and the rest, we never paid heed to. 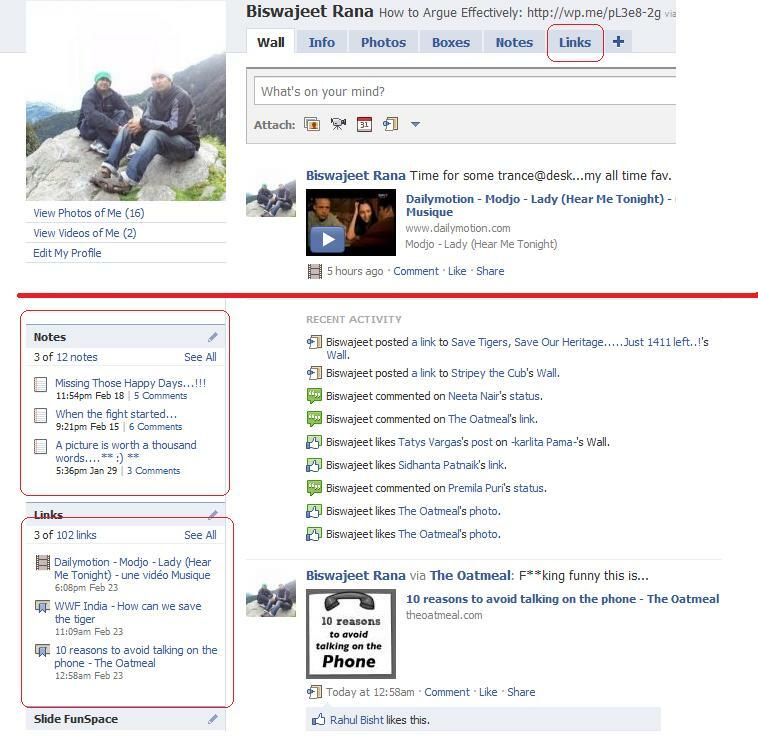 I am talking of Bookmarks on your Facebook homepage on the right panel and the Applications that you use to network or kill your time. In my previous post, few months back I had discussed how to view all the Links/Notes of friends or just anyone’s by manipulating the URL, even if the links’/notes’ tabs/boxes are not present in their profile page ( I will be discussing how to set them in your profile later in this post). But the post is quite techie, n wouldn’t interest the common mass. Can you see a link-label as “Status Updates”? 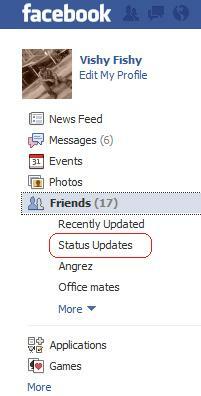 Well, clicking on that will give you all the recent updates by your friends. Now you don’t really miss any & don’t give a chance to your BFF as to why you didn’t comment/like such a witty status. The only disappointment here is there should be a node-subnode (+) icon shown that will make is know that there is something I need to follow-up. But only Facebook Developers know why they haven’t! On the same Application Settings, you could do a bit more. 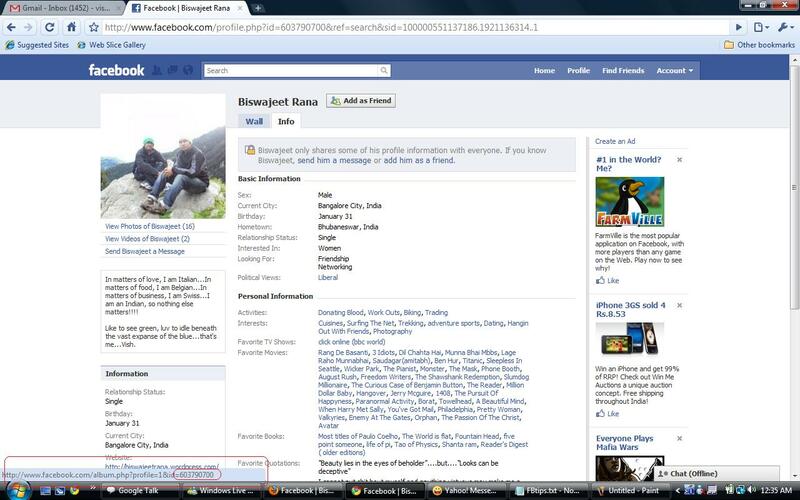 By default FB provides Wall/Info on your profile page. Please let me know if I have missed anything somewhere and if it did help you. Comments/Questions/Suggestions would be highly appreciated. 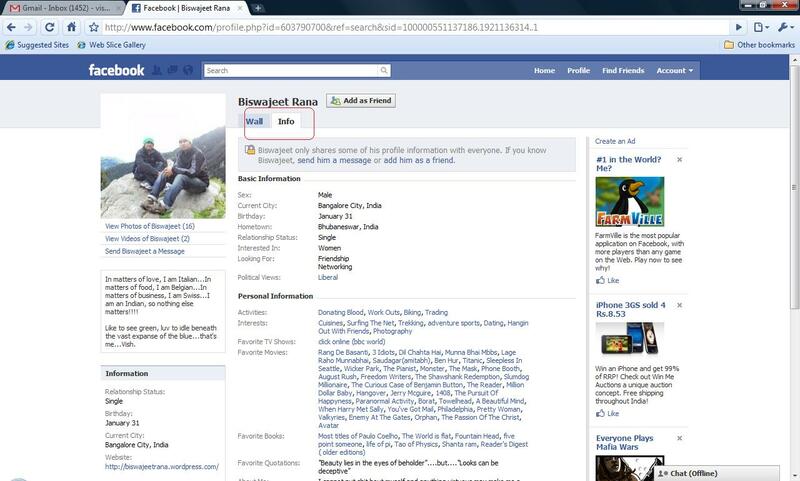 All about Profile Info layout changes on Facebook. As a developer myself, I am sure Facebook developers are suffering from Insomnia and love to work on graveyard shifts. And eventually making us sleep less with the addiction they offer each day! Some new changes, some more R n D to learn, and some more time to adapt to them. Whatever, Hail Facebook, Hail Zuckerberg! It’s simply redefining the concept on social networking. If Google and Apple were known for innovations for what could have been well-nigh unthinkable for a common man…Fb is doing it to the social networks on the same lines. However, I found the business rule/idea behind it to be pretty cool. Whatever you chose as your favorites stuffs (from the auto-suggest drop down) apparently are linked to the FAN PAGES which have a LIKE button instead of a BECOME A FAN button! For e.g. On ‘Likes and Interests’ segment, if you are fond of the ‘Television’ show Man vs. Wild with Bear Grylls, then clicking on it takes you to the fan page on Facebook! This isn’t all! 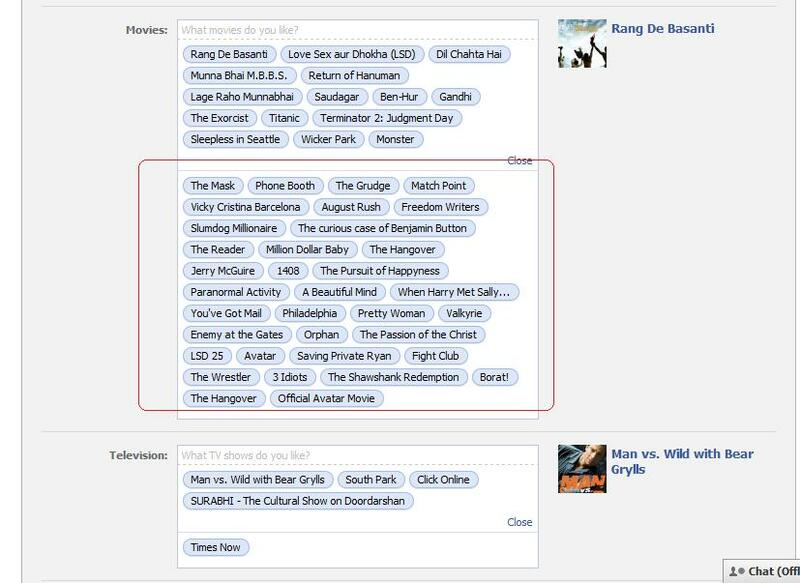 Other way round, if you haven’t put it as your fave TV show on your profile info, just hitting the LIKE button on the fan page you stumbled upon or were suggested by you friend, gets it added to your interest automatically! Speaking on display of the thumbnail-icons: by default – your first choice takes the priority! However, you could choose your own just by clicking on the bubble and save the changes! Now the question is you LIKE-d a fan page but you don’t wish FB to show it among your favorite lists that’s visible to all (FB restricts it to 15). For eg. I join a news network/page to get the latest news feed but I ain’t really fond of Arnab Goswami ( he never pauses when he interviews others), so wouldn’t like it to be displayed on your list…. What would you do in that case? A. Hide it! How? Click on the bubble, now drag and drop below the line (refer screenshot). However, once the user clicks on Show All(<No.>), the entire list would expand. The way to remove it completely is to UNLIKE the page or click on the bubble, then click remove. This is all about the ‘A’ factor for me. I call it atti-factor. So you sent out a friend request to a lady and she does come on Facebook as evident from her feeds appearing on your wall but neither accepts your friendship requests nor responds to your messages lurking somewhere in her inbox, here is what you could do to save your ‘dignity’: Recall/Cancel the friendship request!! On “Account” dropdown, choose “Edit Friends”. You could now interpret the below figure and explore on the encircled options. It’s straight and simple. Additionally, you can try entering the initial alphabets of the person bitterly concerned, and the auto-suggest makes your task easy. 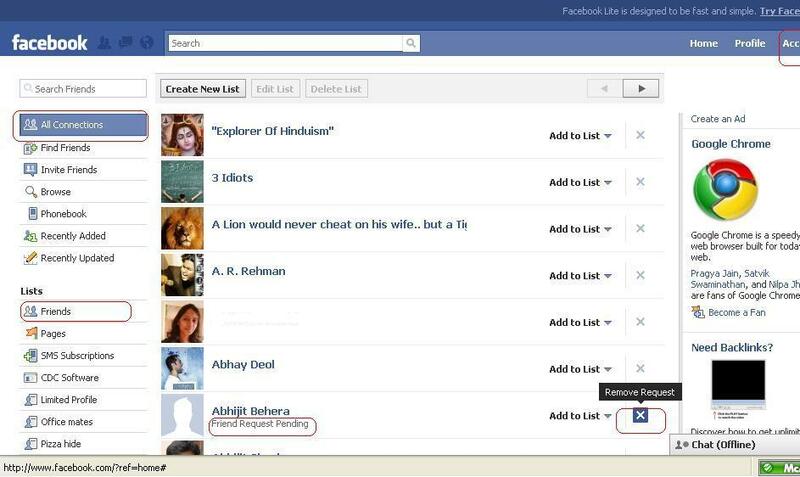 You can even make a list as “Pending” and keep amassing people you add. Releasing the “This request can’t be sent” post soon. Here’s something uncanny I figured out on Facebook quite some time back. It’s quite possible for you to get an update about your friend’s posted link/status/posts late, at times after hours of his/her post and not ‘live’ as touted by Fb on it news feeds. There’s also a bright possibility that you never get an update about your fellow facebookie’s activities/posts (by apps e.g. Social Interview/Photo of the Day) which you would definitely not like to miss if you are a hard-core Fb addict. And definitely for a big time Facebook addict like me, the height of addiction being to such a level that my relationship gets on rocks most of the times!!! But never mind, my face from Facebook will only be lifted away with another Social Networking site at par with Fb. After all I love socializing. So, here’s the solution I figured out. 1. Click on the ‘Most Recent’ (previously Live Feeds) link, scroll down to the footer. 2. Now, click on ‘Edit Options’ & you get a News Feed Settings dialog box/modal window where in the there is a textbox control for ‘Maximum number of friends shown in Live Feed’ defaulted to 250. 3. You can increase this no. to 400/500. Ideally double the no. of friends in your friend list. One thing to notice here, lest you put a big figure. say, 1000, then in that, case the feeds are updated pretty fast and when you click Edit Options you might end up getting a message on the footer by FB saying “No more posts to show”. Voilà! Now you have all your feeds updated and getting displayed ‘live’ on your News Feed page or your profile page. Hope this helps! P.S. Please do post your comment if this works or other discoveries if any. But we aren’t fools! We are smart enough, with our sneaky tactics to overcome the woes (let’s restrict to Fb as of now :D) right in front. So, even if the guy/gurl has set the Links/Notes entirely open to EVERYONE ,yet with the new Fb privacy settings(Friends in Network chopped off) they are just visible till Friends-of-Friends. What you observe here is, neither the Tabs are visible nor the Boxes for Links/Notes. So how to go about it? And you are good to go here and check out the entire catalog of Notes and Links of your Friends/Friend-of-Friends/Stranger. Enjoy Facebooking. P.S. This research on the above post is relevant only on the Privacy Settings set by the facebookie. Lest it’s made entirely private, you better be contented with your own notes and links :D, else kill your time with mine. With the new Facebook profile, to see your bookmarked/shared links type this URL on your browser: http://www.facebook.com/posted.php? This shows you all “My Friend’s Links”. Besides the link label, you can find My Links. Click on it and you are good to go. As an avid Facebookie as well as a techie, I love fiddling around the features of Facebook that continue to delight me yet disappoint me but occasionally on the constantly improvised design changes (business rules in technical terms). At times, the features get so utterly intimidating for first time users, that with so many cool features they still want to stick to their good ol’ social networks. I feel I should have been the brand ambassador for Facebook already for encouraging so many of my friends, rather dragging them to use Facebook. After all who doesn’t like the LIKE to be hit and comments/compliments to be registered! I thought of putting down the stuffs I discover, for there are times when I searched a few requirements on my Facebook profile on google and do not find the proper result to guide me. 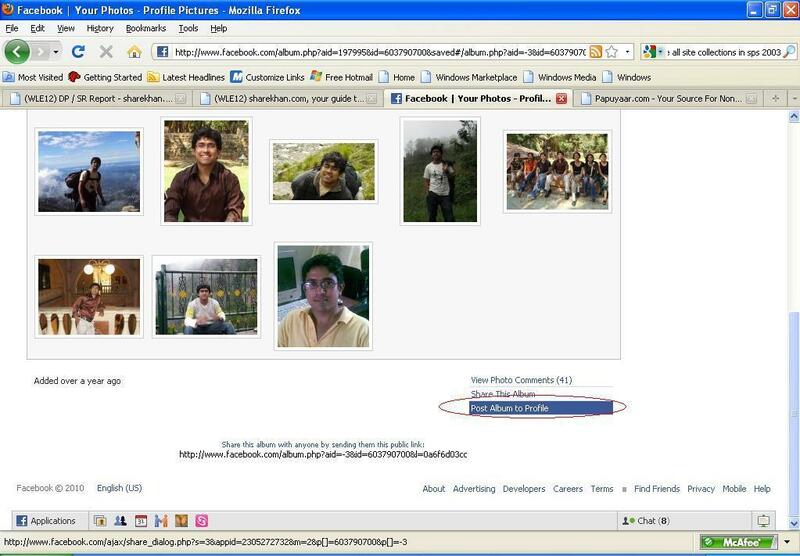 So, here are few tips on how to publish your profile picture on your wall. 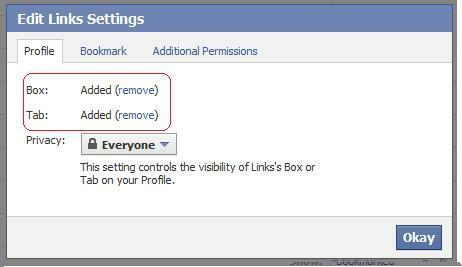 Just change your profile picture, rest is taken care by FB. Your pic appears on other’s feeds/homepage with a bigger image as “[XYZ] changed her profile picture“. No publishing needed anymore. 1. See notification on homepage of DP change in thumbnails. 2. Go to his/her Profile. 4. Click on the specific pic U wish to like…..There U go! New profile pictures, right from the DP (Display Picture) do not publish anymore. This feature, I’m afraid has been called off by Facebook. (or may be a bug on FB’s part of late but highly unlikely) This is noticeable after the latest change on live-feed notifications on Profile Pictures change from your friends and friendship-requested ones. However, there are ways to publish the same photo on your wall. i.e. 2. Tag the Profile Picture with your facebook user name so that the update is instantly sent as a feed to your friends who are instead directed to your profile picture, once clicked. There are a couple of ways to set your profile picture on Facebook. 3. 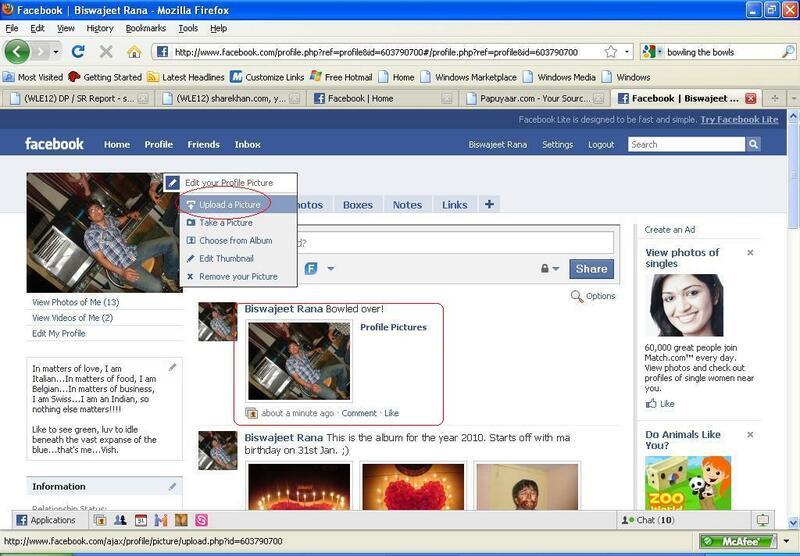 Click on ‘Change Picture’ straight on your already set or to be set Profile Picture of your personal profile. Browse and upload. While the first two options would work in case you already have photos/albums in your profile, the 3rd way is the one if you are new to Facebook. And Voilà! The 3rd way is the only option right now to “publish” your profile picture on your wall. You can choose to skip as per your wish! The description for publishing is set as the caption! Please do let me know if you have any questions or issues on this.